The three basic types of siege engines are battering rams, siege towers, and catapults (a category that includes a wide range of throwing machines, from ballistae to trebuchets). The first two provide access to a castle for invading troops. Catapults, contrary to popular belief, are not normally used to knock down castle walls (though many of them are quite effective at this task). Instead, catapults are throwing machines used as artillery to lob projectiles over castle walls to damage the structures and troops inside. The Dungeon Master's Guide provides rudimentary information on siege engines. While that material is sufficient for an occasional encounter featuring a ballista or a battering ram, a campaign that prominently features siege engines requires more detail. For that reason, the information in this chapter augments and supersedes the information in the Dungeon Master's Guide. All statistics for the siege engines in this chapter assume they are designed for Medium creatures. Adjust as appropriate for siege engines designed for smaller or larger creatures. Creatures smaller than Small typically do not use siege engines. Unlike other ranged weapons, siege weapons deal full damage to objects. The construction times assume that the lead craftsman has at least three unskilled laborers to assist in construction. If that's not the case, divide the progress accordingly (by half if only one laborer is available, and by one-quarter if you're doing it by yourself). Setting up and Moving Siege Engines: It takes a minute to set up or take down a ballista and 10 minutes to set up or take down anything else. To figure out how fast a siege engine moves, look up the weight in the Siege Engine Table, figure out the strength of whatever is pulling it, then consult Carrying Capacity. Divide the siege engine's weight by four if the siege engine has wheels (most do). Ballista: This torsion-powered catapult looks rather like a huge crossbow that launches large harpoonlike bolts through the air. Firing a ballista requires an attack roll by the crew chief, using the crew chiefs base attack bonus and any range increment penalties (since this is a direct attack, no Intelligence modifier applies, unlike with those catapults that make indirect attacks). Unless the crew chief has the Ballista Proficiency feat, he takes a -4 penalty on the attack roll. Additional members of the crew can use the aid another action to grant the crew chief a +2 bonus on the attack roll by succeeding on a DC 10 Profession (siege engineer) check. Unlike most other catapults, a ballista aims at either a creature or an object (such as a section of wall) rather than a square. Loading a light ballista requires two full-round actions (that is, two crew members can load it in a single full round). Loading a heavy ballista requires four full-round actions. A ballista need not be re-aimed; each attack succeeds or fails independent of previous attack rolls. A light ballista takes up a 5-foot square, while a heavy ballista takes up a 15-foot-by-15-foot space. Battering Ram: The battering ram is a simple device consisting of a heavy pole - either suspended by ropes from a movable scaffold or held aloft by troops - that is repeatedly smashed into a gate or other barrier to break it down. The end of the pole is often shod in iron, which can be forged into a variety of decorative shapes such as dragon heads. The typical battering ram is 30 feet long. Including its scaffolding, it occupies a space 10 feet wide and 30 feet long. Up to ten Medium or Small troops can occupy the same space as the ram and its scaffolding, in two rows of five (one row on either side). Larger creatures can contribute to the attack as long as they share at least one square of their space with the ram. As a full-round action, the character closest to the front of the ram makes an attack roll against the AC of the target construction, applying the -4 penalty for lack of proficiency (it's not possible to be proficient with this device). In addition to the damage given on Siege Engines, up to nine other characters holding the ram can add their Strength modifier to the ram's damage, if they devote a full-round action to doing so (the character guiding the ram adds any Strength modifier of his own as well). For example, ten gnolls (each Str 15, +2 modifier) wielding a ram will deal 3d8+20 points of damage on a successful hit. The act of operating a battering ram provokes attacks of opportunity. Mangonel, Heavy or Light: The standard or default catapult described in siege engines, the mangonel is a torsion-powered siege engine. Its single arm ends in a sling capable of throwing a heavy stone hundreds of feet. Like all stone-throwing catapults, a mangonel launches projectiles in a high arc, so it can hit squares out of its line of sight. Loading a light mangonel requires a total of two full-round actions (taking one full round for a crew of two, or two full rounds for a single crew member). Loading a heavy mangonel requires four full-round actions. A light mangonel takes up a 10-foot-by-10-foot space. A heavy mangonel takes up a 15-foot-by-15-foot space. Scorpion: This complex, torsion-powered catapult uses an intricate system of pulleys running along both sides of the base to provide as much power as a heavy mangonel in an engine the size of a light mangonel. Loading or re-aiming a scorpion requires two full-round actions. If the crew fails any check made to load or re-aim a scorpion by 5 or more, the pulley system breaks, rendering the scorpion inoperable. Repairing a broken pulley system requires 10 rounds and a DC 20 Craft (siege weapon) check. A scorpion takes up a 10-foot-by-10-foot space. Siege Tower: A siege tower is a large wooden tower built on wheels that troops use to scale castle walls under cover. The walls of a siege tower are normally 2 inches thick. A typical three-level siege tower is 30 feet tall and takes up a 15-foot-by-15-foot space. It can hold nine Medium creatures per level. A siege tower can be pushed by the nine creatures on the lower level at a speed of 10 feet (siege towers cannot run). The nine creatures on the lower level have total cover. Those on higher levels have improved cover and can shoot through arrow slits. Trebuchet: A trebuchet uses a heavy counterweight to fire heavy projectiles an extraordinary distance. The great trebuchet uses a 30-foot-long swing arm on a fulcrum with twin buckets filled with rubble attached to one end and a sling for the ammunition attached to the other end. The counterweight buckets are hauled into the air by a winch system and held in place by a latch. The light trebuchet, by contrast, uses a bulb-shaped counterweight built into the swing arm. This arrangement makes the light trebuchet significantly easier to use than the heavy trebuchet but limits its range and can make the engine unstable if it's not winched or loaded properly. Loads of shot launched by a heavy trebuchet deal damage to all creatures within 2 squares of the target square. Loading a light trebuchet requires three full-round actions. Loading a heavy trebuchet requires six full-round actions. Re-aiming a trebuchet requires four times as long as loading it, and the weapon cannot be re-aimed while it is loaded. If the check to load a light trebuchet fails by 5 or more, the weapon tips over, dealing 4d6 points of damage to all crew members (as well as any other creatures adjacent to it). Righting a fallen trebuchet requires an hour of work by its crew. A masterwork siege engine costs double the normal price for that kind of siege engine (see Siege Engine Table). A masterwork siege engine grants a nonmagical +1 enhancement bonus on attack rolls made with the siege engine. It also adds this bonus to any skill checks made to operate the siege engine (but not to Strength checks to reload the siege engine). Each individual piece of masterwork siege weapon ammunition costs 300 gp (regardless of the original price of the ammunition). Although the specific siege engine most people picture when they hear the word "catapult" is more properly called the mangonel. In this book [ Heroes of Battle ] the term applies to any type of throwing machine that uses torsion power or counterweights to throw large objects hundreds of feet through the air. Torsion-powered catapults, such as the ballista, mangonel, and scorpion, use skeins - that is, bundles of twisted ropes often braided from hair or tendon - to fling one or two wooden arms forward, sending a projectile into the air. Counterweight catapults, such as the trebuchet, power a swinging arm with a huge counterweight attached to one end. The weight is hauled up into the air by a winch or a team of soldiers and latched into place. The team then places a projectile in a sling on the other end of the swing arm. When the latch is released, the counterweight falls, flinging the sling-end up into the air and sending the projectile flying. Catapults can propel very large objects over incredibly long distances (up to 1,500 feet). Common projectiles include stones weighing from 40 to 150 pounds, massive javelinlike bolts, and even pots of burning oil and alchemist's fire, which can burn down wooden structures within the stone walls, gutting a castle from the inside. Troops have been known to load their catapults with anything available, including loose rubble, chains, discarded weapons, odds and ends of armor, dead mounts, the severed heads of fallen enemy soldiers, and even live captives. Often this bombardment will deal more psychological than physical damage to the castle and its inhabitants. Stone-throwing catapults can also propel bags of "shot." These are tightly packed sacks of small rocks and pebbles that literally explode upon impact, shredding everything within a small area in a lethal spray of rock fragments. Most catapults do not use the normal combat rules for determining the success of their attacks, because typically a catapult is fired not at a particular creature but rather at a specific square on the battlefield. (Ballistae are an exception to this rule, so they use the normal combat rules for determining the success of their attacks.) First, the catapult crew must aim the catapult at a target square. Doing this requires a DC 15 Profession (siege engineer) check by the crew chief (the lead operator of the catapult) and one or more full-round actions taken by the crew of the catapult. Multiple crew members can perform these full-round actions at the same time, reducing the time it takes to aim the catapult. The number of rounds required varies by the weapon. Other crew members can assist this skill check by making a DC 10 Profession (siege engineer) check, as described under Combining Skill Attempts; success on this check this grants the crew chief a +2 bonus on his check. Next, the catapult must be loaded. As with aiming, loading a catapult requires one or more full-round actions taken by the crew members. As before, multiple crew members can perform these full-round actions at the same time, reducing the time it takes to load the catapult (for example, if the catapult requires four full-round actions to load, a crew of four can load it in a single round). The crew chief must succeed on a DC 15 Profession (siege engineer) check, and at least one member of the crew must succeed on a DC 10 Strength check. Other members of the crew can assist with either of these checks by using the aid another action but must choose which check to aid (that is, the same crew member cannot assist in both rolls). Large or larger creatures load a catapult in half the given time, while Small creatures require twice the given time. Tiny creatures can't load a catapult. Finally, the crew chief makes a special attack roll to fire the catapult. He rolls 1d20 and adds his base attack bonus, his Intelligence modifier, any penalty for range increments (see Siege Engine Table), and any other modifiers that apply (see the remainder of this sidebar). A square on the battlefield is treated as having AC 15 against a catapult's attack. This attack is a standard action, and the attack roll can't be assisted by the crew. Catapults (other than ballistae) hurl their ammunition in a high arc. A catapult requires vertical clearance equal to half the range to the target to operate, so subterranean races rarely use such devices. Because of this high arc, catapults can strike squares that aren't in line of sight of the crew, though at a -6 penalty on the attack roll. If the attack fails to hit a target that is in line of sight of the crew, and the catapult's next shot targets the same square, the crew chief gains a +2 bonus on his special attack roll. If successive shots at the same square continue to miss, this bonus improves by 2 on every additional attempt to hit the same square, up to a maximum of +10 (after five straight misses). 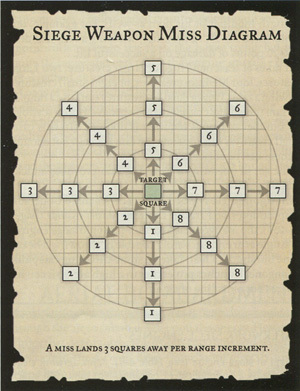 If the targeted square is not in line of sight but can be seen by an observer communicating with the crew, the bonus for successive attempts against the same target starts at +1 and can improve to as much as +5 (after five straight misses). Each of these attack rolls also takes the -6 penalty that applies because the crew cannot see the target. If the attack roll succeeds, the catapult's payload hits the target square. A stone deals the indicated damage to any object or character in the square. A load of shot deals only half the indicated damage (see Siege Engine Table) but deals this damage to all creatures or objects in or adjacent to the target square. A creature can attempt a DC 15 Reflex save to avoid the damage from a stone or to reduce the damage from shot by half. Some special forms of ammunition have their own rules (see Magic Siege Engines). Once a catapult successfully hits the target square, all subsequent shots automatically hit the same square with no attack roll needed, until the catapult is aimed at a different square. Attacks that Miss: If the attack misses the target square, roll 1d8 and consult the diagram below to determine the deviation of the throw. The ammunition lands 3 squares away from the target square for every range increment of the attack. aims at either a creature or an object (such as a section of wall) rather than a square. Bolt 1 gp 3d8 19-20/x2 - - - 6 lb. Bolt 1 gp 5d8 19-20/x2 - - 6 lb. Shot 5 sp 3d6 x2 - - - - - 50 lb. Shot 3 sp 2d6 x2 - - - - - - 30 lb. Stone 1 gp 4d6 x2 - - - - - - 40 lb. Shot 5 sp 3d6 x2 - - - - - - 50 lb. Stone 2 gp 6d6 x2 - - - - - - 75 lb. Shot 1 gp 7d6 x2 - - - - - - 100 lb. Stone 4 gp 14d6 x2 - - - - - - 150 lb. Shot 7 sp 5d6 x2 - - - - - - 75 lb. Stone 3 gp 10d6 x2 - - - - - - 100 lb. ¹ A siege tower that takes damage exceeding half its hit points is inoperable. ² Includes counterweight (roughly 75% of total weight).